Coindesk, which covers blockchain news, found a nugget in a stack of documents submitted to the government of British Columbia. The provincial government’s BC Cannabis Regulation Engagement committee invited stakeholders to submit proposals by November 1, and it received over 130 suggestions on how to implement legal cannabis in 2018. The province was seeking input on issues that included minimum age, personal possession limits, public consumption, drug-impaired driving, personal cultivation and distribution and retail models, all topics that were covered in a discussion paper it issued previously. 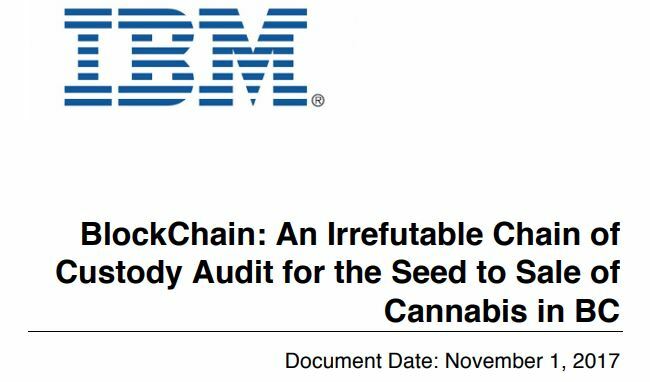 Blockchain technology is likely to play an important role in the highly regulated cannabis industry, and having a large multinational company pushing its adoption will likely validate it further. In the United States, Tokken has been working on blockchain solutions that have been implemented and include payment solutions that address the issues that have led to the country’s cannabis transactions being conducted primarily in cash.